A St. Augustine tradition for over 35 years, Barnacle Bill's offers fresh seafood and much more in a family-friendly environment. Barnacle Bill’s Seafood Restaurant has been a local tradition in St. Augustine since 1981. The restaurant specializes in fresh seafood, great steaks, and signature entrées served in an inviting family-friendly atmosphere. Barnacle Bill's is open for lunch and dinner every day from 6:30 a.m. to 10 p.m., and has moved to a new location up US-1 with free parking available to restaurant patrons. As a locally owned and independent restaurant, Barnacle Bill’s proudly offers only the freshest seafood cooked just the way the customer likes it -- grilled, broiled, steamed, blackened or fried -- as well as sides, soups, salads, and specialty dishes. There's also a variety of exotic drinks to choose from, and homemade desserts like Banana Delight (pictured below), Key Lime Pie, and Piña Colada Cake. In addition to the Catch of the Day, fish tacos and a variety of seafood platters, the menu includes such special dishes as Caribbean Mango Mahi Mahi, Fiesta Fish Bowl, Mahi à la Salsa, Florida gator tail, and Barnacle’s Salmon Sensation. Appetizers include Asian Crispy Calamari, fresh oysters, and Blue Crab Bites. Barnacle Bill's is known for traditional comfort food. The fresh catch is prepared to guests’ desire; grilled, broiled, steamed, blackened or fried, along with a variety of sides, soups, salads and tasty desserts. Barnacle Bill’s also has fresh seafood, all served in a local setting. “Landlubbers” can select from a full menu as well, including an 12-oz. Blackened Ribeye, Matanzas Chicken, and Hickory Crusted Pork Ribeye. Barnacle Bill’s has lots of sides and salads to choose from as well, including a full kids’ menu. Check out our Kids Eat Free IHG Members’ Program, and now serving Breakfast for a fresh start. Barnacle Bill’s has expanded hours and is open 7 days a week - serving Breakfast 6:30 a.m. – 11:00 a.m., Lunch 11:00 a.m. – 3:00 p.m., and Dinner 3:00 p.m. – 10:00 p.m. 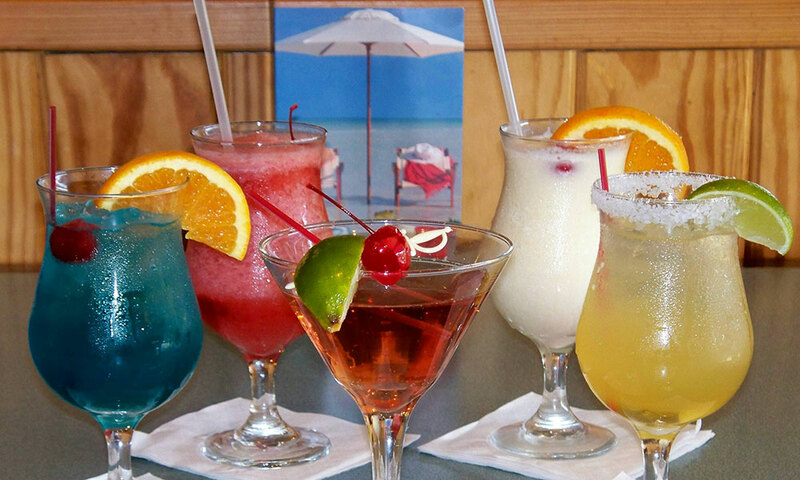 Relax and enjoy a refreshing beverage at the bar, in the restaurant, or at the pool. Bar service from 3:00 pm to closing. Happy hour is from 3:00 pm - 7:00 pm at Barnacle Bill's. Barnacle Bill’s also offers extensive group menus, especially for school and senior groups. Call (904) 819-0030 for more information on groups. Barnacle Bill’s is conveniently located at 1302 North Ponce de Leon Boulevard. Have been there a couple of times with friends. We had the fried shrimp and it was good. Really nothing to brag about. Would go back maybe for lunch if we were in the area. My sister-in-law and I were visiting the area and someone suggested Barnacle Bills. We were a little thrown by the appearance but let me tell you... The wait staff was fantastic, and the food was fabulous! My sister-in-law had never had Gator tail and I have to say it was some of the best that I've had. They have a cauliflower dish that is to die for! (I used the left over sauce to dip my fries in!). I would definitely go back! I would LOVE the recipe for the cauliflower! This restaurant is right next door to our hotel and I loved the fact that we didn't have to drive anywhere and fight to find parking. The service was excellent and the fried shimp was terrific. The cauliflower was barely warm and hubby's fries were not hot but the chowder and shrimp were excellent. My husband and I stopped in for lunch and were very glad we did. I had the fish tacos they were great. He had the fried shrimp and he loved them. The waitress was friendly and attentive. We will be going back again.